Daikon... what now? If you're unfamiliar with this food you're not alone (because I had never heard of it either). One of my commitments this year is growing #thewellthcookbookclub (what a mouth full). Why? Well I LOVE trying new recipes and buying beautiful cookbooks, but I found they were just collecting dust (tragic). That's why I decided to crack those babies open & get recipe testing! One of the recipes I recently tried was a daikon noodle salad from The Beauty Chef. After making a grocery list, I was on a hunt for daikon! Also referred to as Chinese radish, this long white root is considered milder and less peppery than other radishes. Served raw, it’s mild and tangy, with a crisp and juicy texture, and when spirilized, it's the perfect alternative to traditional noodles (or zoodles). Alleviates respiratory issues. It can help clear out excess phlegm and eliminate bacteria and other pathogens from your respiratory tract. Promotes digestive health. Daikon helps facilitate better digestion of proteins, complex carbs and fats, which in turn prevents constipation and increases nutrient uptake in the gut. Assists in detoxification. It stimulates urination, which is necessary for keeping the kidneys clean. Has potential cancer-preventive ability. This vegetable possesses antioxidant phenolic compounds that may help reduce certain types of cancer. Bolsters your immunity. The vitamin C in daikon stimulates white blood cell production, which may speed up repair and healing in your body. Alleviates inflammation. Daikon juice’s anti-inflammatory properties can help decrease inflammation throughout your system, which may lead to a healthier heart, lower gout and arthritis risk and reduced pain from injuries and muscle cramping. Promotes bone and skin health. Its high calcium content may be helpful in preventing osteoporosis. It also has antioxidant benefits, which may help prevent wrinkles, increase circulation and even reduce the appearance of blemishes and age spots, giving your skin a natural glow. Helps with weight management. Daikon is a low-calorie and low-cholesterol vegetable, but it’s high in fiber and many other nutrients – qualities that are ideal for people who want to maintain a healthy weight. Ok, now that you're an expert on daikon, it's time to make a wellthy bowl using this veg! bring a cast iron skillet to medium heat. Cook your desired protein as you with. I prepared the salmon by placing the skin side down, cooking it on the stove top until it was 1/2 cooked through, then transferring the pan to the oven, where I let the salmon broil for approximately 7 minutes. This duration will vary depending on the thickness of the fish, but it should be golden on top and no longer pink in the centre. In the mean time, peel and spiralize the daikon, shred the carrot, chop kale, slice the radishes, and de-shell the peas. divide the vegetables evenly between the two bowls. In a small bowl, combine the ingredients for the dressing, whisk and drizzle desired amount over salads. 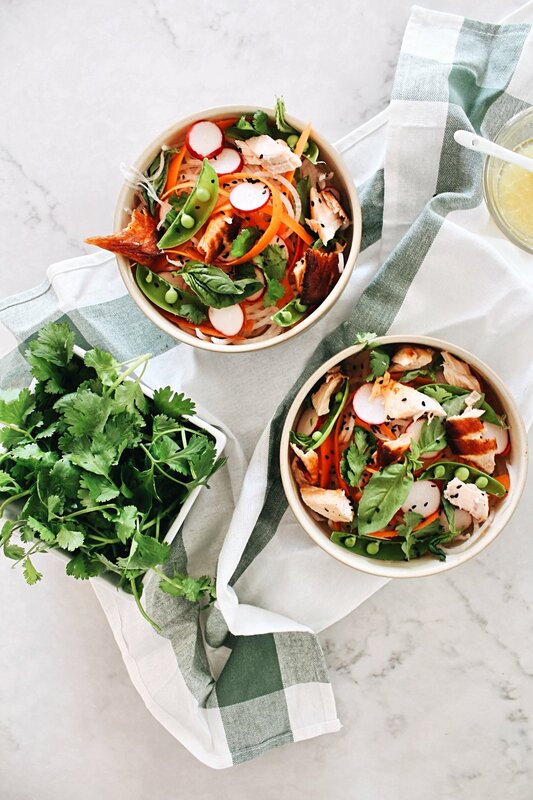 Finally, add a piece of protein to each bowl & top with cilantro and basil.